My perfect day? I love to be outdoors, to hike across the countryside, feel the sun on my skin and to clear my mind. If water is also involved and perhaps I also discover or learn something new, then my day is perfect. Do you feel this way too? 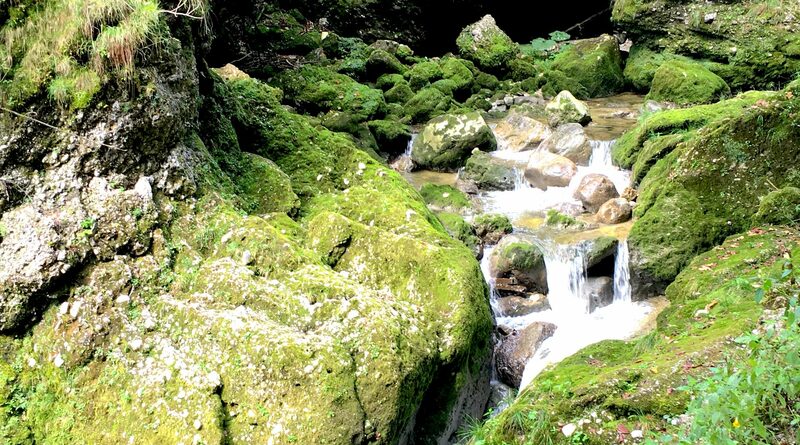 Then you should absolutely contemplate a hike through the Glasenbach Gorge south of the city of Salzburg. What is there to experience and discover? A beautiful spectacle of nature that is easy to reach from the city, a fantastic hike through a water world that almost seems surreal, a glimpse into our planet’s past and last but not least two alpine restaurants that satisfy more or less any culinary wish. What are you waiting for? Let’s go! For me, there is really hardly anything more exciting than to experience and feel nature with all my senses after a summer rain. Glittering raindrops in the sunshine, the air is fresh and clear, the colours seem to shine a bit more intensively than usual and a sense of ‘reawakening’ spreads. Wonderful! 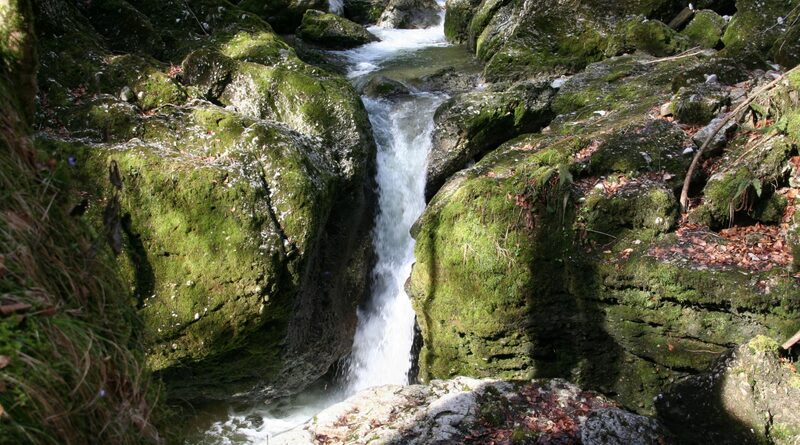 So it’s the perfect time to leap onto my bike once again, take the Salzach River Bike Path southwards and to pay a visit to the Glasenbach Gorge. 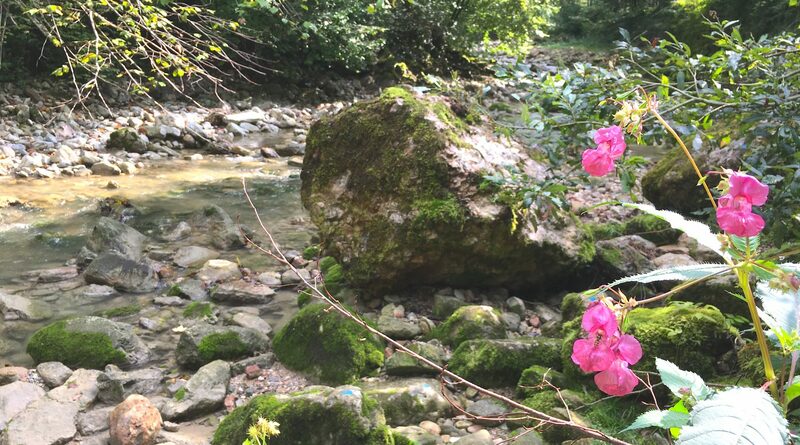 For a long time I wanted to hike through this wonderful world of water to experience the flora and the history of life itself, and to have a look at the geological nature trail there with its 13 presentation boards. From the city of Salzburg, the average cyclist needs about half an hour to leisurely arrive in Glasenbach, the starting point and destination of the hike. The south of the city is also easy to reach by car, bus or suburban railway for anyone who does not happen to have a bike available. The ride to my actual goal – the gorge – is a real pleasure. Even if cars and people romp about in the city like in an anthill, here along the Salzach river it is always quiet and you have a beautiful view into the mountain world in SalzburgerLand. Mountain ranges such as Watzmann, Untersberg and the Tennen mountains – and all the others – tower above the countryside here and silently show me the way to Glasenbach Gorge. 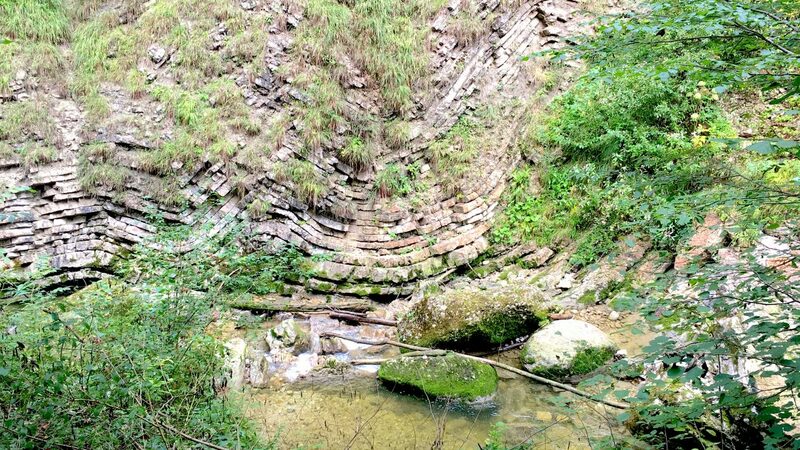 The gorge is not only well-known because of its beauty and the abundance of flora and fauna, but also because of the fossil treasures which have been found here. One particular example is a perfectly preserved skeleton of an ichthyosaur that can be admired today at the Haus der Natur local natural history museum in Salzburg. The unique specimen gave this gorge a reputation among archaeologists that went far beyond the boundaries of the Salzburg province. Even today, one regularly meets staff members from universities who dedicate their research efforts to the world of rocks. Shortly after Glasenbach, I finally reach the entrance to the gorge. A few parking spaces for cars are also available along the side of the road, but naturally it is more convenient for a person to lock their bike on a tree and march off. Incidentally, the gorge-like valley is a protected landscape element, and pollution or other influence is strictly forbidden. Following the signage, after about 5 minutes you reach the entrance to the gorge, where the first presentation sign with interesting stories from long bygone days of our earth is already waiting for us hikers. 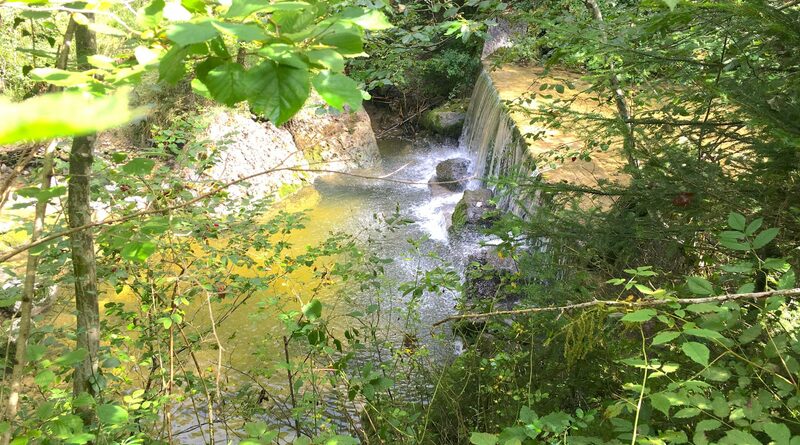 The rushing water falls over a small dam wall and already gets me in the mood for what awaits me here. The trail along the Glausenbach stream leads constantly and gently uphill, the sun flashes through the crowns of huge deciduous trees, and nothing but the creaking of my steps on gravel mixes with the roar of the water. How wonderful that such a paradise can be reached in such a short time from the city of Salzburg. Even if summer is showing its best side today, here in the forest it is still quite cool, and I repeatedly catch myself and notice how I take deep breaths of the clean, humid air. “Gosau conglomerate”, a form of rock which is frequently found everywhere on the northern rim of the Alps, molasse conglomerate, red nodular limestone, grey marl, folded layers and much more can be discovered here. The presentation signs play their part so that today’s hike is not only an experience of nature, but I also learn a great deal about the world in which we live. It is actually amazing what you can learn from a stone. You only have to know where you should look and which questions you have to ask. For a while I ponder the situation before me until after a bend in the trail, I am suddenly standing at the spot where the aforementioned ichthyosaur lived over 200 million years ago and where later – much later – its teeth and vertebra were found. At this point the following is noted on my inner “to-do” list: absolutely pay a visit once again to the Haus der Natur in the Salzburg city centre! Now the trail meanders deeper and deeper into the forest, and a ray of sunshine very seldom gets lost in here. Moss-covered stones and tree trunks, the crystal-clear mountain water that seeks its way through the rapids far below me, and the wonderful solitude of this site give me the feeling as if I were at an entirely different location. I slowly take the rucksack from my shoulders, sit down on the knotted roots of an old, awe-inspiring tree and let the world here have an effect on me. If someone were to tell me that I was in ‘The Shire’ from the book ‘The Lord of the Rings’, I would believe it without thinking too long about it. After a hearty gulp of water and a small apple from my rucksack, I set off on the trail again. After all, there’s still quite a bit to discover. After a few more presentation signs, waterfalls, rapids, footbridges and even a short, somewhat steeper ascent, I finally reach the end of the nature trail that is easy to recognise by a bridge. Here you could turn around and walk back down the trail to the starting point. Or alternatively, you can leave the bridge on the left-hand side and hike further through forest and meadows to Hirsteig. I repeatedly pass isolated farmsteads, hop over streams and cover metre after metre in altitude. 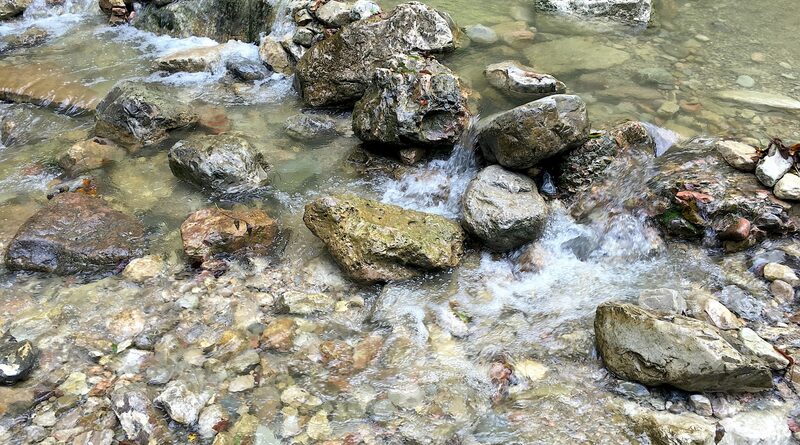 As gentle as the ascent along the stream was earlier, now it can be felt even more clearly. 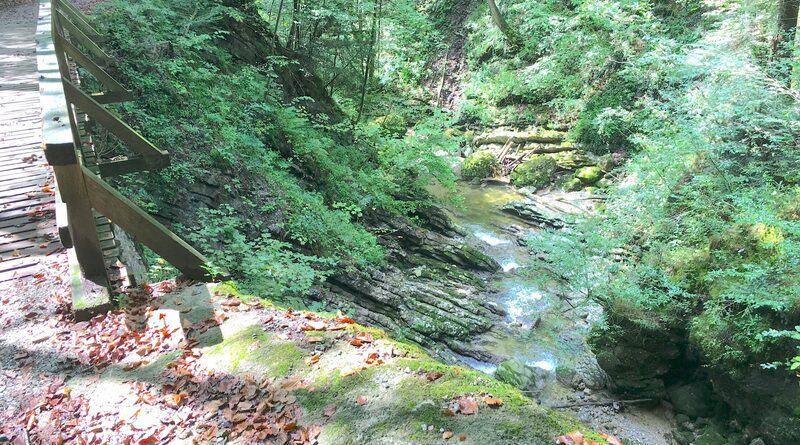 Nevertheless, it is beautiful to hike here. After a while I reach the Fageralm, a culinary establishment the reputation of which for outstanding home cooking has already filtered down to me. Since my stomach has also already been growling for some time, and the scent in the air here is truly enticing, I accept the invitation to linger and treat myself to a hearty meal.